On video footage, an unidentified young woman appears shocked as she beats the cop in a game of rock-paper-scissors and subsequently avoids an underage-drinking citation. One underage drinker, who happens to be white, got off scot-free from a citation after beating Texas cops at rock-paper-scissors, Raw Story reports. 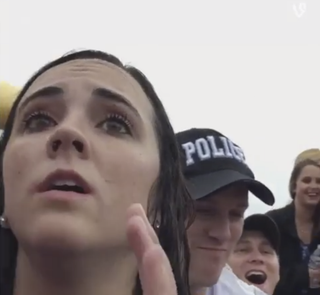 Cellphone video of the encounter, which took place over the weekend at the Chilifest country music festival in Snook, appears to show the unidentified college student holding her face in relief and cheering with friends after her “rock” beat an officer’s “scissors.” Promptly after the showdown, the three officers turn around and walk away. “I have seen the video and can only say that this is unacceptable and unprofessional conduct by these officers,” Dennis Gaas, the constable for Burleson County Precinct 2, which hired the officers for security at the music festival, said, according to Raw Story. The county, the constable acknowledged, doesn’t have enough officers to provide adequate cover for Chilifest, so he often hires around 100 other officers from other departments to help control crowds and traffic. Over the weekend, officers issued 113 citations and arrested 44 people. Of course, it is up to the discretion of an officer whether to issue citations. However, the way in which this particular case was decided left the constable disgruntled. “[Playing] games to get someone out of a ticket, I have a problem with that,” Gaas said. The officers involved, whose names have not been disclosed, were told they would not be working at Chilifest again. “It gives all of us a bad name,” Gaas said. The end result of this case is a sharp contrast with that of University of Virginia student Martese Johnson, who was bloodied and had to receive stitches to his head after an encounter with Virginia Department of Alcoholic Beverage Control officers. Johnson was attempting to gain entry to a bar on St. Patrick’s Day when his ID brought scrutiny because of a discrepancy in the address on the ID and the address Johnson gave. He was denied entrance before officers threw him to the ground, causing him to hit his head and receive a wound that needed 10 stitches.